Cream fur, milk-chocolate highlights - Chocolate Point Siamese cats sound good enough to eat! But what are they like as cats? Chocolate Points have been around for a long time, first appearing in show reports from the 1880s, although these cats were not given recognition by any of the cat registries until 1950. Loving and affectionate, 'Choccie Point' cats are the comedians of the breed. These cats are extroverted and fun-loving. They enjoy playing games and try hard to please their owners, making them easy to train and wonderful as pets. Of course, the notes above are a bit of a generalization - I've also known some cats of this color who've been quite introverted and shy! 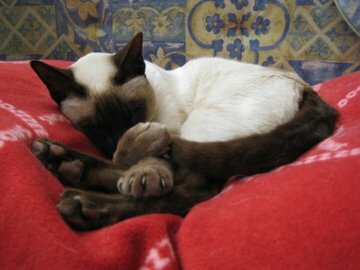 A sleepy 'choccie' - ivory fur, milk-chocolate points, and especially, note the pink paw pads. The Chocolate Point generally has ivory-white fur which stays pale throughout their lifetime. This differs from Seal Points, whose coats tends to darken as they get older. Seal Points sometimes end up with very dark coats indeed! Occasionally, though, you may find a Chocolate Point Siamese with a cinnamon tone to their coat. This is set off by warm-toned milk-chocolate colored points (facial mask, ears, tail, and paws). Their nose leather and especially their paw pads have a pinkish undertone. Is your cat a Chocolate or a Seal Point? If in doubt, this pinkish undertone is a good way of telling a Chocolate from a Seal Point, which has a dark brown nose and paw pads - no pink at all. Chocolate Point cats are less common than Seal Points and the kittens develop their coloring later than their darker Seal and Blue relatives. 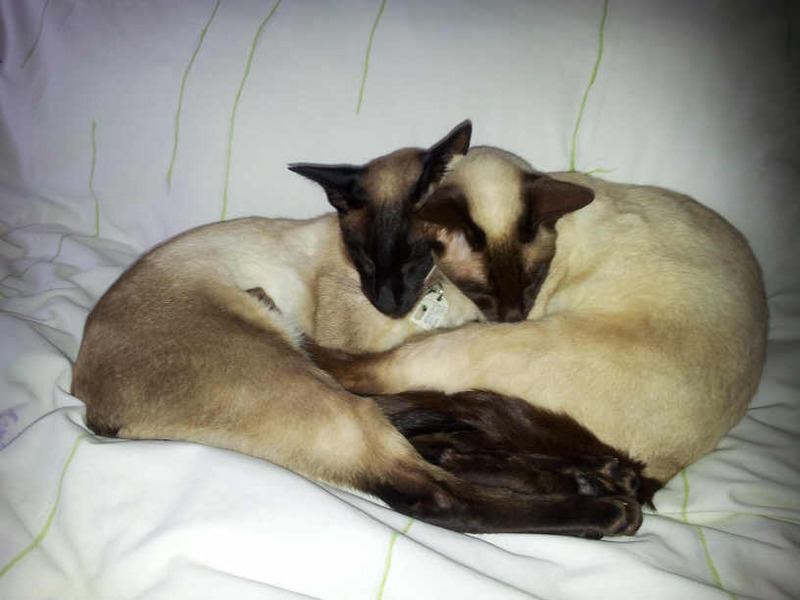 The beautiful pair of snuggly cats below are Bailey (a Seal Point, on the left) and Safire (a Chocolate Point, on the right). As you can see, Bailey's coat and points are colder-toned and darker than Safire's. Safire's coat has a warm, cinnamon tone to it, and will probably stay that color, whereas Bailey, being a Seal Point, may very well get darker than he is now.